Aubrey grew up in Northern California and went on to study interior design and architecture in Monterey and San Diego, earning her Bachelor of Fine Arts in Interior Design. While attending San Diego State University, she focused her studies on the impacts that structures and their materials have on our planet. Furthering her education, she studied sustainability and earned her LEED Green Associate. She also studied permaculture earning her Permaculture Design Certificate from Quail Springs in Cuyama Valley, CA. While focused on sustainable design, she minored in Spanish while attending SDSU studying the language in Costa Rica, Mexico, and Guatemala. After transplanting from San Diego back to Northern California, Aubrey is currently working at a Therapeutic Garden Center in Chico, CA. In her work she continues to tie landscapes and buildings together in attempt to create systems to not only be self-sustaining but also regenerative. 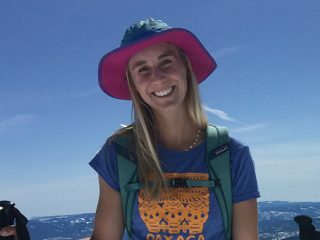 She looks forward to using her knowledge and experience to merge her appetite for travel, outdoor recreation, and love for the planet while assisting STOKE certified.